Smack, china white, horse, black tar . . . all slang names for heroin. We are often told what happens to our bodies and our minds if we use this drug, but less commonly discussed is how the byproduct of a simple flower is converted into one of the most addictive drugs known to man. Also, not discussed much is how this drug makes its way from far-off growing areas to the United States. The abuse of heroin-whether by inhalation, ingestion, or injection-is the last step in a process of many, and it is those preceding steps that we will discuss. 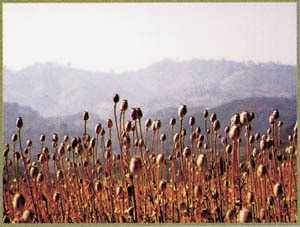 Opium poppyfields in the northern Shan State of Burma. Flowering Opium Poppy Mexican Black Tar Heroin Heroin #4, also known as Smack, China White, and Horse. 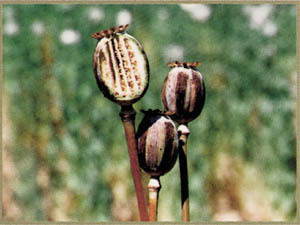 Heroin is derived from raw opium gum, which is produced only by the opium poppy plant, although other varieties of poppy exist. 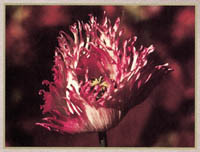 The California, Flanders, and Oriental poppy are three types grown domestically. 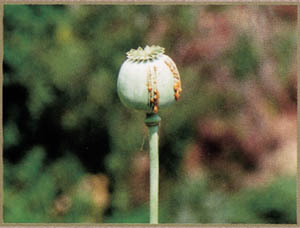 Poppy--both the opium-producing and non-opium-producing varieties--can be found in many different climates all over the world. 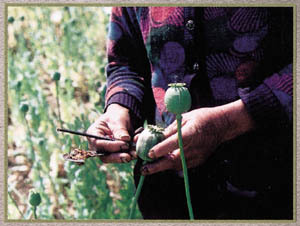 Opium poppy has been grown in Asia for many years, and more recently has been cultivated in Latin America. 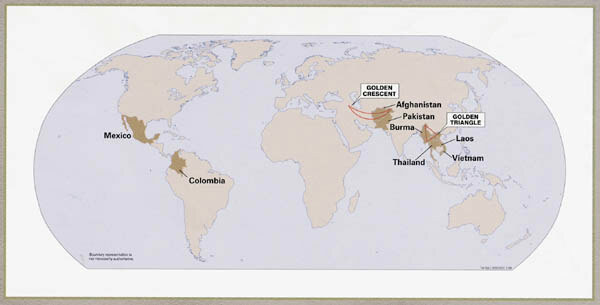 About 60 percent of the world's opium is produced in the remote parts of Southeast Asia, especially in the aptly named Golden Triangle, which includes parts of Burma, Laos, and Thailand. Other primary growers include Afghanistan, Pakistan, Colombia, and Mexico. 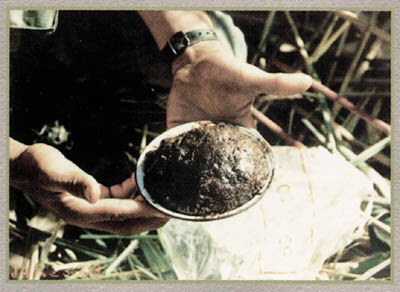 Recently harvested raw opium gum. Countries with opium poppy cultivation. 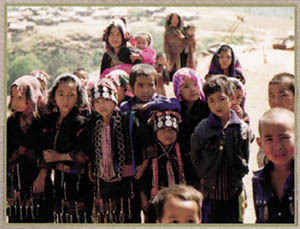 The leading producers of opium poppy in the world are the hill tribe people of Southeast Asia. 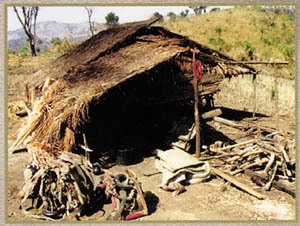 They live under very primitive conditions with no electricity and no running water. 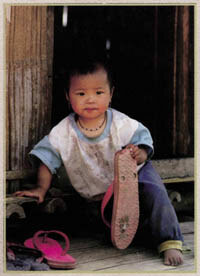 They are very poor--opium is their currency, and it is sold or traded for basic necessities like food, clothing, and utensils. 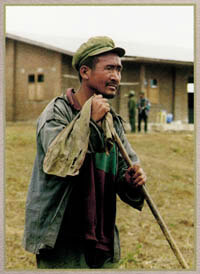 Opium is also used locally as a substitute for modern medicines because few medical supplies are available in these remote areas. 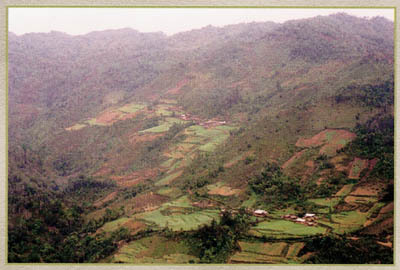 The hill tribe growers use a technique called slash-and-burn farming to prepare the poppyfields for planting. After all the trees have been cut down and vegetation cleared and burned, the farmers take handfuls of seed and spread them over the field. Poppies take about three months to mature, and the farmer may weed the fields once or twice during that time. 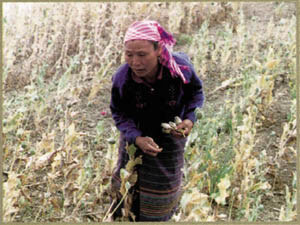 When the plants are mature, the farmers start harvesting opium gum using primitive, unsanitary tools, made from whatever can be found nearby. The tools are often handed down from generation to generation. 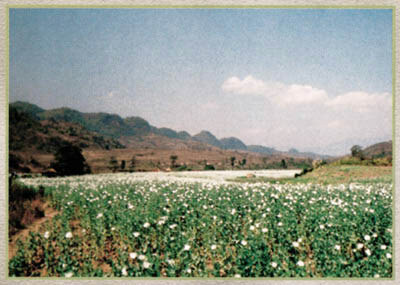 Flowering opium poppyfield in Burma. Just before reaching maturity, the poppy plant produces a flower. After about a week, the flower petals fall off, leaving a capsule. Raw opium gum is harvested from this capsule. 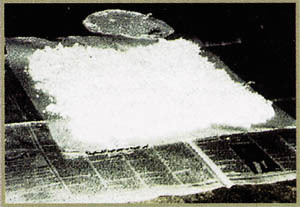 The surface of the capsule is cut, or "scored," with a knife containing three or four small blades, and the opium gum oozes out through these cuts. The next day, the farmer scrapes the gum off the capsules with a flat tool called a scraper. 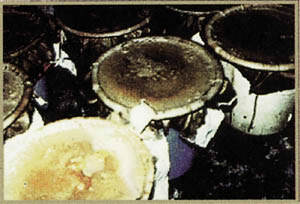 Each capsule is usually scored in this manner three to five times, or until scoring produces no more gum. Poppyfields contain thousands of poppy capsules, so harvesting is very labor intensive. Once the gum is collected, the farmer sets it out to dry for several days, then wraps it in banana leaf or plastic. 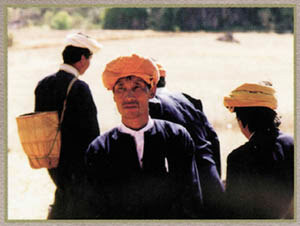 The gum is stored until a trader comes to the village--opium gum has a very long shelf life and can gain value over time. After the harvesting process is complete, the capsules are cut from the stem, allowed to dry, then broken open so that the seeds inside the capsule can be used for next year's crop. Opium poppy capsule being scored. 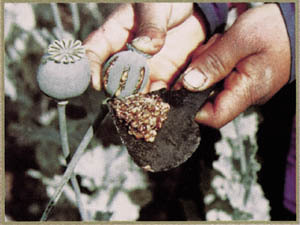 Raw opium drying on a poppy capsule. Collecting capsules for next year's poppy crop. Refining raw opium into heroin is a tedious, multistep process. 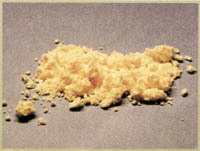 Once the opium gum is transported to a refinery, it is converted into morphine, an intermediate product. This conversion is achieved primarily by chemical processes and requires several basic elements and implements. Boiling water is used to dissolve opium gum; 55-gallon drums are used for boiling vessels; and burlap sacks are used to filter and strain liquids. When dried, the morphine resulting from this initial process is pressed into bricks. 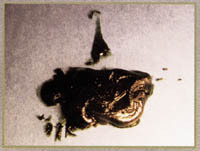 The conversion of morphine bricks into heroin is also primarily a chemical process. The main chemical used is acetic anhydride, along with sodium carbonate, activated charcoal, chloroform, ethyl alcohol, ether, and acetone. The two most commonly produced heroin varieties are No. 3 heroin, or smoking heroin, and No. 4 heroin, or injectable heroin. 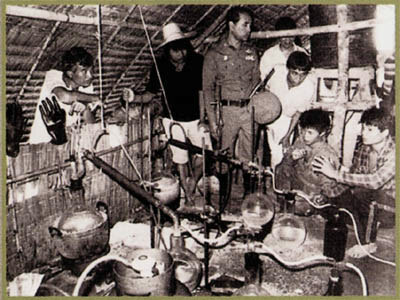 Seized heroin refinery in Southeast Asia. The refining process has been perfected to the point where heroin purity levels are above 90 percent, as the product leaves the refinery. However, as the heroin makes its way to US, it passes through many hands. To maximize individual profit, substances that make the heroin less pure and more bulky are added at each stop. These dilutants are white and powdery just like the heroin and include caffeine, baking soda, powdered milk, and quinine. By the time the heroin gets to the user, it is often only about 40 percent pure, and little is known by anyone involved in the production or trafficking of the drug about the components of the other 60 percent. Heroin enters this country in many ways. It is carried in luggage, in shipping containers on cargo ships, and by courier. Recently, drug smugglers have been forced to be more creative because trafficking laws are getting more stringent, and police and customs officials are devising new ways to detect drugs. Newer smuggling methods are seemingly limited only by a trafficker's imagination. Couriers swallow bags of heroin, cross the border, and wait for the bags to run their digestive course. Bags of heroin are also put in the gas tanks and tires of cars and driven across borders, or mixed in with garbage that ends up in refuse containers. Sometimes the heroin is placed inside figurines or in furniture. In an extreme example, recently a border patrol unit in Texas found about $5 million worth of narcotics stuffed in human body parts--legs, arms, and intestines--that had been stolen from a hospital. The traffickers said this was to hide the drugs' smell from drug-sniffing dogs, but it was unsuccessful. 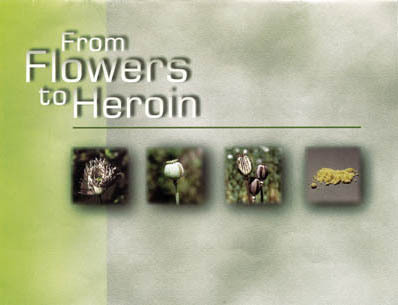 Hopefully, we have provided you with a better understanding of the long chain of events by which a product from a seemingly innocuous flower becomes heroin sold on US streets. The drug goes through many different hands and changes form several times, and there is really no way for a buyer to know how it has been altered or how it was smuggled across the border. With the strong help of law enforcement, different governments, and government agencies, we continue to increase our understanding of the problem.